There’s no end in sight to the hellish-looking eruption at Mount Mayon, the Filipino volcano that’s been spewing a mix of ash and lava for two weeks. This week, after Mayon ratcheted things up with tall ash clouds and half-mile-high lava fountains, volcanologists placed it on alert level 4 out of 5—meaning a “hazardous eruption” could be imminent. But, hold on a sec. If the situation pictured above doesn’t already constitute a hazardous eruption, then what on Earth does? I turned to volcanologists for answers. Those answers turned out to be complex. That said, the eruption at Mount Mayon could certainly get more hazardous than it already is. Right now, the mountain is seeing lava fountains and ash plumes reaching about 500 meters (1640 feet) above the crater. It’s also experiencing dangerous pyroclastic flows—ultra-hot plumes of volcanic ash and rock that race downslope, sometimes at hundreds of miles per hour. Basically, nightmare avalanches. This is all pretty standard behavior for the most active volcano in the Philippines. “This is kind of a baseline eruption for Mayon and it happens frequently,” Krippner said. Things could continue this way for a while—months, even. Or, Mayon could crank it up a notch, with more lava erupting from the crater, taller plumes that deposit ash over a wider area, and more pyroclastic flows. The volcano could also go from erupting effusively—as it’s mostly doing now—to erupting more explosively. “That would shift it from beautiful lava fountaining to larger ash plumes,” Krippner explained. 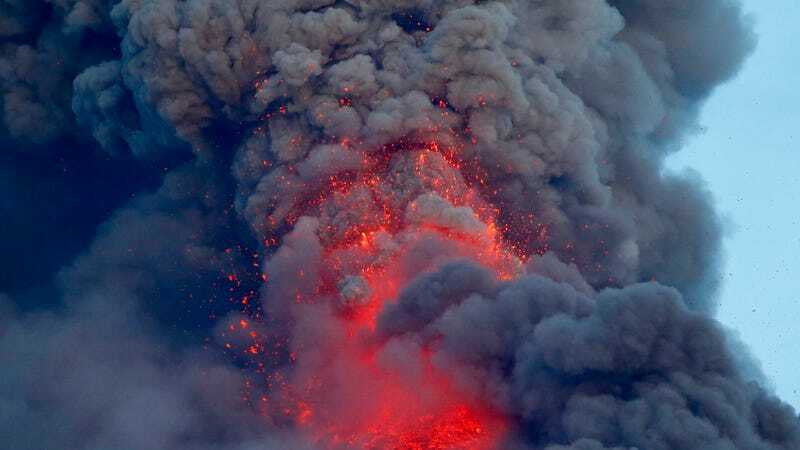 Eruptions can become explosive for a variety of reasons, ranging from a buildup of pressure within the volcano to a change in the composition of the magma itself. Thicker magmas—those with a higher silica content—are more likely to erupt explosively when trapped gas bubbles try to escape. These changes occur because the magma the volcano is drawing from isn’t one big, homogeneous body—its physical and chemical properties can evolve over time, in turn affecting the explosiveness of the eruptions. If Mount Mayon’s eruption becomes more explosive, we could start seeing much larger ash plumes—the volcano’s deadliest eruption, in 1814, is reported to have flung ash all the way into the stratosphere 11 miles up—and more pyroclastic flows. Krippner noted that while most of the pyroclastic flows witnessed so far are the result of chunks of recently-solidified lava breaking away and tumbling down the mountainside, large ash plumes can create pyroclastic flows all on their own, when fine, rocky material associated with the cloud collapses and races downhill. Enormous mudslides, also called lahars, are another concern when the ash and rocks piling up on the slopes of a volcano meet a heavy rainstorm. “Then all that ash can go into rivers, where you can create this cement-like slurry that can pick up boulders, trees, and houses,” Erik Klemetti, a volcanologist at Denison University, told Earther. Such flows can be incredibly dangerous and disruptive in their own right, traveling all the way to the ocean, according to Krippner. Klemetti noted that after the enormous Mount Pinatubo eruption in 1991, the region saw “a good decade worth of mudflows.” While the eruption at Mount Mayon is still much, much smaller than that eruption, lahars could be a long-term concern. Filipino authorities are used to eruptions like this, and they’ve taken necessary precautions, including designating an 8 km (5 mile) danger zone around the volcano. As of Friday, some 78,000 villagers had been evacuated, according to the Associated Press. Meanwhile, the Philippine Institute of Volcanology and Seismology continues to take Mount Mayon’s vitals. Volcanologists have a range of tools at their disposal, frequently monitoring seismic activity, gases escaping from the volcano, the chemistry of fluids coming out, and even slight changes in the volcano’s shape, to determine what’ll happen next. Of course, they can also simply use their eyes.